please read the article through the link below. 1. Which side do you take? There's only one fact about what happened on the tennis court. Have you ever wondered why people hold different opinions on the same fact? 2. What are your opinions about Serena's tantrum in the finals? 3. What do you think about the sexism accusation of the umpire? 4. Is Serena a victim of sexism or sore Loser? Does sexism excuse her behaviour, and why? 1. What do you think about the racism and sexism accusations of the cartoonist? 2. Would it be a lot different if the person in contention was not Serena Williams, and why? if it was Naomi Osaka, what would be the event? 3. 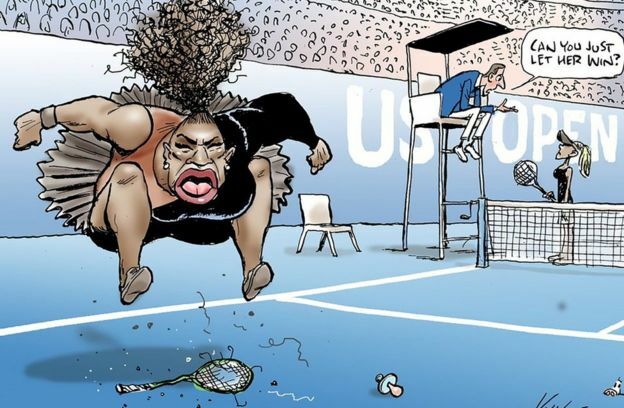 What are your thoughts on the newspaper’s defence, “If the self-appointed censors of Mark Knight get their way on this Serena Williams cartoon, our new politically correct life will be very dull indeed.”? What do you think is "new politically correct life" that the news is trying to say? 4. Again, which side do you take? Have you changed your mind after the discussion? Tennis games are so fascinating to many sports fans, me included, but not a fan of women’s tennis games; unless they are the games of 謝淑薇 & 詹氏姊妹. Hope my patriotism somewhat compensates for the sexism accusing-trigger in favor of men’s tennis games. I haven’t paid much attention to this particular incident as I’m still piecing together my broken heart over my absolute favorite’s injured-retire from the men’s semi-final. Moreover, it’s not an unheard-of news; in fact, a very familiar tennis déjà vu when Serena Williams was trailing a late-round match in the Grand Slam; particularly, in the US Open! I can’t help but wonder how detrimental “Kiasuism” is to bring out the demons or serve as the catalyst for a breakdown in a match ?! Serena Williams, is undoubtedly the GOAT(Greatest Of All Time) and a role model with multifaceted achievements for so many fans to look up to. However, her temper tantrum history is just as well-known as her on-court heroics. Years later, after she hung up her tennis sneakers, people may inevitably dredge up all those tennis blow-ups while acclaiming her accomplishments or serving inopportune flashbacks for future similar incidents. From some reasonable speculations, in sports world, I believe no referee or umpire is out to go toe-to-toe against any particular players whom one is assigned to serve in a game unless there are some blatant or severe violations. Noticeably , the paramount games are always equipped with the top-notch world class one for an impartial process to minimize controversy, so that I chose to trust that this Portuguese umpire wouldn’t put his reputation and professional career on the line to exert sexism against Serena or any particular player in any game. I’m all for everyone expressing themselves, but we have also got to know when to draw a line. If Serena Williams had drawn the line after the 1st violation,she might have gotten different center of attention or outcome in that very game. After all, for a sport player, performance speaks the most volume in a game. Serena should’ve let her performance speaks volumes more than anything else. I would say that the umpire was fair in all three warn and penalties; the coach did gave illegal hand signals, be it an instruction to Serena Williams or just a cheer-up gesture; Williams did abuse her racket during the game and she did verbally attack the umpire, accusing him as thief and liar. There's no doubt all three cases violated tennis rules. Rules aside, I don’t think any umpires should tolerate such a malicious verbal personal attack. After all, respect for others is the bottom line. It is definitely up to the umpire’s discretion whether and when to blow whistle. In the third case, he could give Williams a verbal warning first before imposing more severe penalties. It’s also totally justifiable when the umpire took a zero tolerance policy. Williams’ accusation of sexism is somewhat groundless and ,sadly, only makes her like a sore loser. being a self-proclaimed skeptic and cynic, i'm so glad you guys take the same side with me about the event haa~ as to the question why people hold different opinions on the same fact, Janice answered something about favoritism, if i didn't get it wrong. here i would like to add another reason, un-favoritism. if you have favoritism to someone in your mind, more often than not, you will turn a blind eye on their wrongdoing. on the other hand, if you have un-favoritism toward someone, it's highly possible that you will always scrutinize their behavior and amplify what they have done wrong. we all have probably falled for it. ok, that's human nature, isn't it? for living under politically correct life, if not new, as Gloria said, it would be more peaceful, and with which i totally agree! !